Freedom Service Dogs | We love our volunteers! April is Volunteer Appreciation Month—and we sure do appreciate our 518 dynamic, dedicated, what-would-we-do-without-you volunteers! And not just this month but every month, day, and moment of the year. In 2018, our terrific and talented volunteer team donated an astounding 25,155 hours to Freedom Service Dogs. That’s the equivalent of 12 full-time employees—and to put that number in perspective, 12 full-time employees would increase our staff by one-third! Our volunteers truly make FSD’s world go ‘round. Their hard work, love for dogs, and passion for our mission is felt in every corner of our organization. They assist with our dog intake program, daily dog care, and enrichment activities. They volunteer as dog handlers, puppy raisers, and weekend fosters. They help with our administrative duties, fill our event planning committees, and serve as board members. 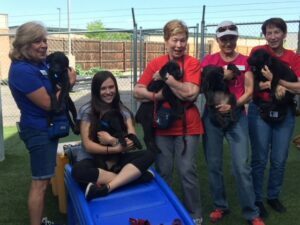 No way, no how could we dramatically change the lives of our clients and our dogs in training without each and every one of our volunteers. So here’s a huge THANK YOU from FSD—plus a pooches gracias from all our dogs—to our very valued volunteer team. You’re simply the best! Want a volunteer gig that gives back more than its weight in wags, kisses, and a sense of satisfaction? We’re in special need of volunteer puppy raisers and weekend fosters. Learn more or contact Volunteer Manager Ryan Holman at 303-922-6231 x201 or rholman@freedomservicedogs.org.